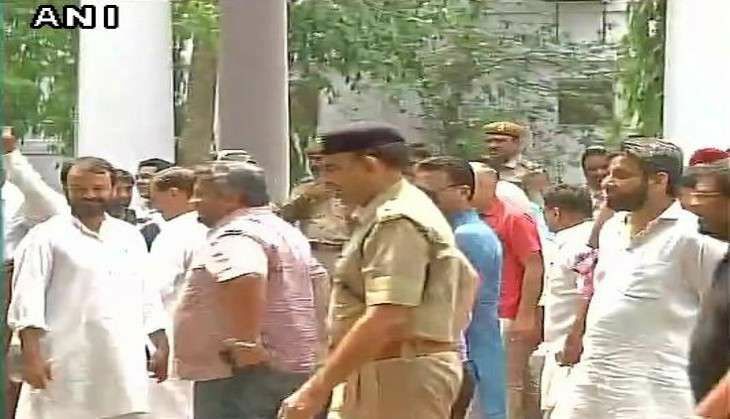 Delhi's Deputy Chief Miniser Manish Sisodia and 52 AAP MLAs - who were detained on 26 June as they marched towards Prime Minister Narendra Modi's residence to surrender - have been released. Section 144 of the CrPC was imposed in 7 Race Course Road ahead of the AAP leaders' protest. The leaders were released a few hours after they were detained at Parliament Street police station. The protest march came a day after the president of the Ghazipur Vegetable Market Association submitted a complaint against Manish Sisodia, accusing him of intimidating businessmen there during an official visit. Sisodia said that he would march to the PM's residence as a sign of protest, and surrender. "Complaint filed against Manish Sisodia yesterday. Manish will go to 7, RCR today to surrender himself before PM," Delhi Chief Minister Arvind Kejriwal tweeted on 26 June with a copy of the complaint filed against Sisodia. After the complaint was filed on 25 June, Sisodia turned to Twitter to allege that PM Modi may turn the complaint into a case of extortion, violence and molestation and use it as an excuse to arrest him. He also alleged that the people who filed the complaint were indulging in illegal activities in the market, where he had gone for a surprise inspection. According to reports, the police said earlier that they have received a complaint from the president Surender Goswami, but no FIR would be registered as no cognisable offence was committed by Sisodia.